A visual arts collection entitled “My Love for Arts, My Love for Cuba,” was inaugurated on Thursday in Havana as a donation by US collector Gilbert Brownstone in tribute to the five Cuban anti-terrorist fighters, who were arrested in 1998 in the United States. 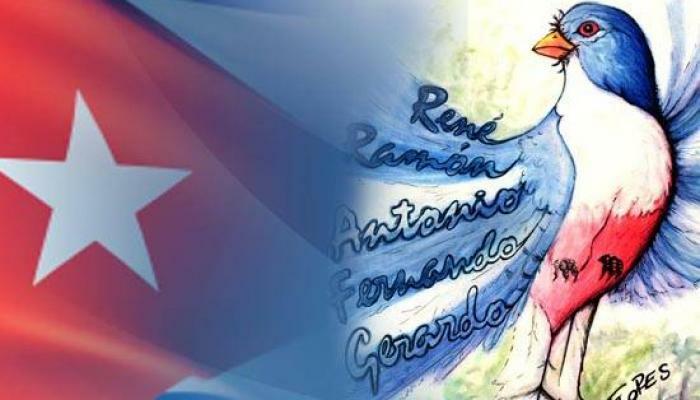 In the presence of Rene Gonzalez and Fernando Gonzalez, the only two of the five men who have returned to Cuba after they served their unfair sentences in US jails, the collector said that he was privileged to have met the relatives of the Cuban anti-terrorist fighters. The remaining three: Gerardo Hernandez, Ramon Labañino and Antonio Guerrero are still held in US prisons despite a huge international campaign for their release. During the inauguration of the exhibit at the Jose Marti Memorial, the president of the National Council of Visual Arts, Ruben del Valle, said that the collection of so many works of art will be displayed until August 17. The collection includes works by Picasso, Roy Lichtenstein, Richard Lindner, Andre Masson and other outstanding artists, which Gilbert donated to Cuba. In September 2011 Brownstone visited Gerardo in the Victorville maximum security prison in California, to offer his support and solidarity. Below is a report of this visit. 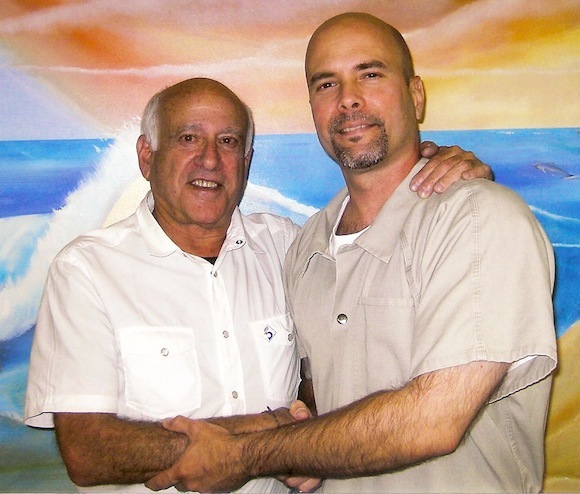 GERARDO Hernández, one of the five Cubans imprisoned in the U.S. for 13 years, is a strong-willed man, according to renowned American art critic Gilbert Brownstone. President of the Foundation which bears his name and an important figure within the art world, Brownstone visited Gerardo in the Victorville maximum security prison in California, to offer his support and solidarity. He said that meeting Gerardo was a striking moment, coming face to face with such a brave, yet sensitive man. “That’s how he can overcome such a nightmare and detach himself by talking about beautiful things,” Brownstone stated to Prensa Latina. Gerardo Hernández, Ramón Labañino, Antonio Guerrero, Fernando González and René González, identified as the Cuban Five, were arrested on September 12, 1998 in Miami, where they were gathering information to warn their country of criminal plans launched by anti-Cuban groups based in South Florida. During the trial, the defense substantiated many irregularities but the Cuban Five were sentenced to long terms in prison. Gerardo Hernández is serving a double life sentence plus 15 years. Brownstone is also a museologist, art specialist, and curator. He graduated from the Sorbonne in Paris and studied art history with the Pierre Francastel (1900-1970), one of the founders of sociology of the arts. “We talked a lot. We shared views on the world in which I work, as well as my deep love for Cuba and its people, and to my amazement, he knew everything about me,” Brownstone said of his conversation with Gerardo. Located in Victorville, California, with the Mojave Desert to the south, it is about 130 kilometers northeast of Los Angeles. Nevertheless, “His mood is very good. He avoids talking about these things and talks about life without sadness. I did not find him sad. “Gerardo radiates strength, he is someone who loves. He deeply loves his wife Adriana, his family, his country,” Brownstone reiterated. On August 16, Gerardo’s defense presented a reply to the government’s opposition to his habeas corpus petition submitted to Judge Joan Lenard, who within an undetermined period of time will decide if his request to submit new evidence will be granted. Gerardo was sentenced to life in prison for conspiracy to commit murder. “He is innocent. It’s not enough just to say it, the evidence is there,” Brownstone said. He reiterated that Gerardo had nothing to do with the 1996 downing of two light aircraft belonging to the anti-Cuban organization Brothers to the Rescue. “That was a sovereign decision made by the Cuban state. I understand that the planes violated Cuban airspace and it was not the first time they had done so,” Brownstone commented. The humanist, art critic and collector donated works of renowned 20th century artists to the people of Cuba last year. His foundation, established in 1999, is devoted to supporting and taking action on behalf of cultural development and education. “The time to act is now,” he said, when he donated the more than 100 pieces, including works by Andy Warhol, Marcel Duchamp, Pablo Picasso, Camille Pissarro, Georges Rouault, Donald Judd and Joan Miró, among others. The works were given to the Museum of Fine Art in Havana and constitute the most important gift made to the institution since its reopening in 2001. Brownstone said that, with this gesture, he hopes to repay a debt to the Cuban people and the Five, to whom he dedicated the donation. This entry was posted in Cuban Five, Home, International and tagged art, Cuban Five, Gerardo Hernandez, Gilbert Brownstone, imprisonment, injustice by Russell. Bookmark the permalink.